Duncanville ISD Superintendent Dr. Marc Smith had some exciting news to share with members of the Duncanville Chamber of Commerce at their September luncheon. His vision was about to be realized, for Duncanville High School to have a Collegiate Academy. Dr. Smith and Duncanville High School Executive Principal Tia Simmons welcomed community leaders and elected officials to the Sept. 25th official opening of the 7,000 square feet Collegiate Academy. The renovated space, located just above the campus library, has been designed to create an atmosphere very similar to a student union. Duncanville ISD Chief Communications Officer Tiara Richard and Dr. Leonard Garrett, Mountain View College Vice President of Student Services and Enrollment Management, also spoke at the unveiling. Thanks to a partnership with Mountain View College, #DiplomaAndDegree students at Duncanville High School can now earn up to 60 hours of college credits when they receive high school diplomas. There are currently 4,363 students enrolled at the high school, with 120 freshmen enrolled in the Duncanville High School Collegiate Academy. 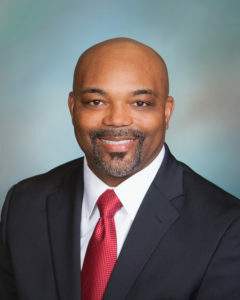 Principal Simmons noted that the program is academically challenging, and students have to be dedicated if they plan to graduate with both a diploma and a degree. 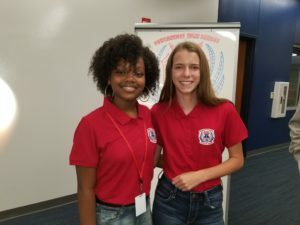 Two Duncanville High School students earned associate degrees last year, and 13 students will graduate from the program this year. The opening of the new Collegiate Academy space will help attract more students to the program. Unlike similar programs, Duncanville HS students won’t have to leave the campus to earn their college credits. They are able to engage in extracurricular activities such as sports or band while applying themselves to earn college hours. Attending the event and touring the newly renovated space above the library were State Senator Royce West, Duncanville Mayor David Green, Chamber of Commerce President Steve Martin, and other community leaders. Two students who have enrolled in the Collegiate Academy, Lesleigh Taylor and Hope Harper, conducted the tour. Lesleigh said she plans to graduate from Duncanville High School with 60 hours of college credit, go on to a four year college and then medical school to become an oncologist. She said her ambition is to help people. Hope, who is the daughter of Athletic Director Clint Harper, also plans to graduate with 60 hours of credit. Her family moved to Duncanville from Marshall in East Texas. Hope, who plays volleyball, said she is weighing a number of options before deciding on a major. Our student tour guides pointed out Collegiate Academy classrooms and other features in the renovated space. Collaboration rooms that encourage team work, mobile white boards, and a variety of seating configurations are all part of the student union design. All DISD schools received the highest possible rating from Texas Education Agency (TEA), based on 2016-2017 STAAR test results. PACE High School received a ‘Met Alternative Standard’ rating. The district also showed growth in the area of college and career readiness, demonstrating that Duncanville ISD schools continue to equip more students with the skills necessary to continue their education, pursue an interest in the military or seek a professional career. Nine Duncanville ISD schools received distinctions, meaning these campuses finished in the top 25 percent of 40 comparable schools in growing students, college readiness and advanced performance. They are Byrd Middle School – 3 distinctions; Hardin Intermediate School – 3 distinctions; Brandenburg Intermediate School – 2 distinctions; Kennemer Middle School – 1 distinction; Central Elementary School – 1 distinction; Merrifield Elementary School – 1 distinction; Hastings Elementary School – 1 distinction; Alexander Elementary School – 1 distinction; and Bilhartz Elementary School – 1 distinction.